Weezer and Snuggie - band sells new CD alongside the cult blanket with sleeves! 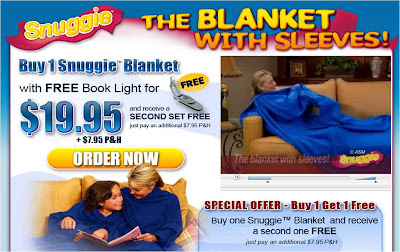 Snuggie have a huge (cult?) following in the US. Not yet a mainstream phenomenon in the UK, but internet appearances are starting to give visibility to Snuggie products - none more so than Weezer's decision to sell their new CD in combination with a Weezer Snuggie! 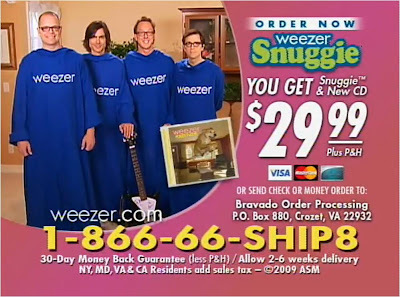 Weezer have taken Snuggie integration to another level though. In the UK we recently saw Dizzee Rascal promote his latest album on TV with a Dizzee Rascal TV shop parody, but Weezer have actually combined sales of their new album Raditude with a customised Weezer Snuggie! Could this be the Christmas that sees all manner of exercise equipment and lifechanging gadgets sold together with mainstream music releases?! Shake Weight - this can't be for real can it?